Why a Charis at Agnes Scott College Partnership? Our commitment to innovation is at its heart a commitment to sustainability; you, our community members, have invested so much into Charis as a gathering place and a home, and are always seeking new ways to ensure that Charis will remain a community institution for generations to come. Metro Atlanta’s landscape is always changing, so, in an effort to make sure we could weather the capricious economic tides, our board, staff, and volunteers came together in late 2013 to begin a strategic plan that would seek enduring partnerships for Charis. From these conversations it became clear that we should sell our longtime home at 1189 Euclid Ave. NE. In 2016, we sold our Little 5 Points building and leased the space from the new owner until we moved to our current home at 184 S. Candler St. Decatur, GA 30030 on April 1, 2019. Agnes Scott College has been a longtime friend of Charis Books and Charis Circle. Many “Scotties” have worked at the bookstore over the years or served on our board of directors. We regularly host Agnes Scott College students as interns and partner with faculty to sponsor readings, lectures, and teach-ins. ASC is a historic and trans-affirming women’s college that encourages its students to “think deeply, live honorably, and engage the intellectual and social challenges of their times.” In 2015, we began talks with Professor Beth Hackett of the Women’s Studies Department, which led to conversations with then Agnes Scott President Elizabeth Kiss about what it would mean for the college and for Charis to become Agnes Scott College’s campus bookstore. Charis Books and Charis Circle are nationally known in the bookselling industry for our innovative hybrid business model and commitment to sustaining and growing book culture in the digital age. Charis Books and More is the 2018-2019 We Need Diverse Books Bookseller of the Year Award winner and both Charis Books and Charis Circle are regularly recognized by community organizations, non-profits, and news organizations as leaders in the field of mission driven business and feminist organizations. Together, Charis Books and Charis Circle provide the only local, dedicated, feminist gathering space, open 7 days a week, and program more than 270 events a year dedicated to encouraging the expression of diverse and marginalized voices, working for social justice, and fostering sustainable feminist communities. As conversations with Agnes Scott evolved, it became clearer that the partnership would be a natural fit for both institutions, providing stability for Charis Books and Charis Circle, and an innovative, independent, and flexible bookstore and programming partner for Agnes Scott College. We began serving our collective communities in the new space on April 1, 2019; and are excited to build the partnership under the leadership of new Agnes Scott College president, Lee Zak. Will Charis Books remain an independent bookstore and will Charis Circle remain an independent non-profit? Yes, this is a partnership, not a merger. Charis Books and More and Charis Circle will both remain wholly independent. Charis Circle will continue to be governed by our Board of Directors (drawn from the Charis community, which includes Agnes Scott College students and staff) and will make programming choices which are accountable to that board. The bookstore will remain independent and will continue to make curatorial choices based on our feminist mission. While we will always endeavor to be good members of and partners to the Agnes Scott College community, neither the store nor the Circle will be directly governed by the Agnes Scott College board of trustees. We are committed to being good stewards of the history, values, and vision people throughout the world have imbued in Charis through the years and believe this partnership reflects those values. 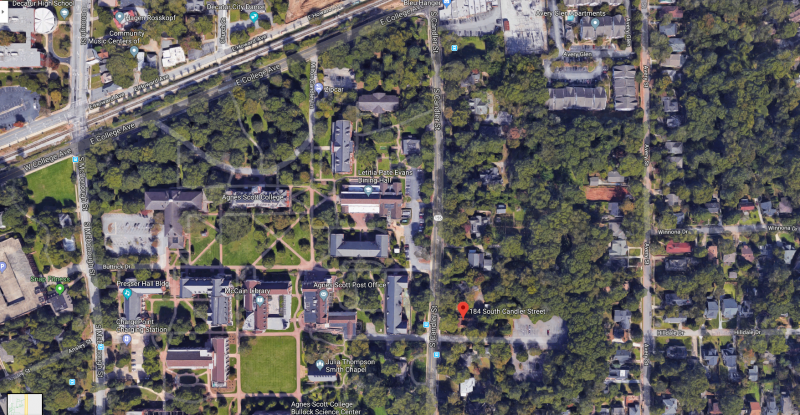 Where is Charis at Agnes Scott College be located? Charis is located at 184 South Candler Street, on the left side of the street if you are coming from downtown Decatur. We are across the street from what many people think of as the “main campus,” on the corner of the S. Candler parking lot. There is a crosswalk that connects us to the contiguous campus. See campus map. Ample parking for the general public for both shopping and events is available behind the building via the driveway to the right of the building in the South Candler lot. Two van accessible spots are located via the driveway to the left of the building within a few feet of the lefthand ramp. What MARTA bus route or station do I use? The Number 15 Bus Route (Candler Rd/South DeKalb) MARTA runs right in front of our new building. The Decatur MARTA train station is .5 miles from our store and is a well-lit, walk or ride. We have traversed the route in a power wheelchair and found that while the city has some improvements it could make to the sidewalks, the route to and from the store is accessible to people who use power wheelchairs and to people who use manual wheelchairs. It is also well marked with tactile warnings for people with visual impairments. If you are arriving from the MARTA train station and are assisting someone using a manual chair, there are a few places where the sidewalks are challenging to push over from behind. How is the building accessible? We have been working with community and professional accessibility consultants to help make the new Charis space as functional and beautifully accessible as possible for all members of our community. Charis Books is a fully wheelchair accessible space with on site van accessible parking, two ramps, and additional overflow accessible parking nearby. The interior shelves are on wheels so that the space is as modular as possible, allowing optimal flexibility for all of our community members’ needs. Our bathrooms are wheelchair accessible and gender neutral with motion activated fixtures. Both bathrooms have wheelchair accessible baby changing tables. Our directional signs are written in braille. Our events are mic'd for sound. We caption videos when we show them in the space. Free ASL interpretation is available for most Charis Circle programs upon request. Please email info@chariscircle.org to request interpretation as early as possible. The interior fixtures, lighting, and materials have all been chosen for their low environmental and chemical impact and their ease of use. The space has all LED lighting. The space is not scent or chemical free but we do our best to minimize the use of chemicals and scents throughout the space and use low VOC materials whenever possible. If you have specific questions about the space or how an event can be made more accessible to you, please do not hesitate to contact us at info@chariscircle.org.Our committment to disability justice means we also welcome feedback and suggestions to help us figure out what makes the space work best for all kinds of bodies. How will Charis Circle programming change? With the addition of the dedicated programming and meeting space, we hope to offer many more daytime events, meetings, and community gathering opportunities. We are also partnering with Agnes Scott College to expand the roster of speakers they bring to the campus and to expand the diversity of speakers we bring to the store. How will the book selection change? The bookstore remains independent and will continue to make curatorial decisions based on our feminist mission. In addition we are excited to carry books by and for members of the Agnes Scott College community. Students will purchase their textbooks online from Follett. We will continue to special order any book you need and will continue our E-book partnerships with Kobo and our audiobook partnerships with Libro.FM. You can order books 24/7/365 from www.charisbooksandmore.com. What college related items will Charis at Agnes Scott College sell in addition to books? Charis at Agnes Scott College will carry most items provided in the current campus bookstore, with the exception of textbooks. Featured items will include official Agnes Scott College-branded merchandise and clothing, toiletries, school supplies, snacks and drinks. I have a suggestion about snacks/ASC clothing items or other school store items I would like Charis @ Agnes to carry. How do I make suggestions? Please email Charis Books Co-owner, Angela Gabriel, directly at AngelaMarieGabriel@gmail.com to suggest brands, items, sizes or styles for the school store. I am a student/faculty/staff member/alumnae will Charis carry my book? Charis at Agnes Scott College is excited to highlight the literary and scholarly achievements of Agnes Scott College community members! Please email Charis Books co-owner, Sara Luce Look, directly at Sara@Charisbooksandmore.com to talk about getting your book in the store. I am planning an event on the Agnes Scott College campus with an author, will you bring books to sell at my event? Please reach out to Sara@charisbooksandmore.com as you are planning your author/speaker events. We are excited to bring books anywhere on campus and to partner with students, faculty, staff and alumnae. I am a student, staff, faculty member, or community member and I have an idea for an event or a partnership that Charis should host, who do I talk to? Please email Charis Circle Executive Director, E.R. Anderson at eranderson@chariscircle.org to talk about all programming ideas, community partnerships, and space use. You don't have to have written a book to present a program at Charis. I want to volunteer at Charis how can I do that? We are building out our Charis Ambassador program now and we would love your help. Please email info@chariscircle.org to get plugged in. I want to donate money, stock, or items to support the programming of Charis Circle or include Charis Circle in my planned giving/estate planning how can I do that? I want to stay informed about Charis Circle events, how can I do that? Please join our email list here. I am a member of the Agnes Scott College community and I have additional questions related to the campus community. Please visit this ASC specific FAQ for all questions related to campus life that are not addressed here. Please email us directly at info@charisbooksandmore.com with any questions not answered here.